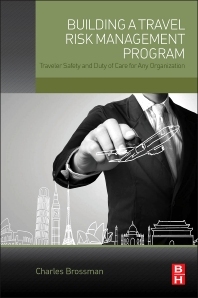 Building a Travel Risk Management Program: Traveler Safety and Duty of Care for Any Organization helps business and security professionals effectively manage traveler risk by showing them how to build a complete travel risk program. While global corporate travel risks are increasing exponentially, many security and business managers are not well-versed in the rapidly changing global landscape of travel risk, nor do they fully realize the multitude of risks their companies face if they don’t comply with their legal obligations—“duty of care"—for protecting their employees from foreseeable harm, which can cost a company in the form of extensive fines, productivity loss, business interruptions, stock price loss, litigation, and even potential bankruptcy. This book is the first to bridge the gap between the topics of travel management, security, and risk management. It serves as a reference point for working with other departments, including human resources and legal, paving the way for better internal cooperation for travel managers and security managers. In addition, it helps organizations craft a travel risk management program for their unique needs that incorporates the most important policies and procedures that help them comply with legal obligations. Corporate Security managers, Security consultants, Risk Managers, Business professionals who travel, travel managers, human resource managers, in-house legal counsel. Charles Brossman is an internationally recognized expert, speaker and writer on travel risk management. He is a former corporate travel manager, and has held senior level positions at global travel management companies as the sole travel risk management subject matter expert covering over 150 countries, specializing in developing and implementing travel risk management products and services around the world. Mr. Brossman is a former member of the GBTA Risk Committee and the GBTA Foundation Risk Task Force, and currently sits on the advisory board for the Global Congress on Travel Risk Management, influencing industry best practices and teaching them to corporate clients and organization members at conferences, meetings and webinars throughout the year. Learn more about Charles at charlesbrossman.com, and follow him on Twitter at @travelcharles. Charles does a good job of walking the reader through the basic elements of a TRM Program and some of the key topics and issues that come up with management and employees. Great collection of information in one place!